Mix the water and casting compound together in your container (Dr. Meldrum suggests adding the water first), and stir (don't whip) to a consistency of pancake batter. Tapping the container on the ground can help remove any air bubbles which can create weak spots in the track. The patching compound should tell you the appropriate amount of water to use, but usually it's around 2 parts compound to 1 part water. Gently pour the casting compound into the track, filling all parts of it and up to the plastic border you've created around your track. Allow the material to set. Time will vary depending on temperature and humidity and the substrate your mold is in. At this point, you may want to write the date and location into the top of the plaster so you don't forget where you found it... Especially if you go on to find many more! Once it hardens, dig around the border and pry up with a trowel. While Casting Tracks is still a great way to get a good copy, in the event you are not able to carry all the plaster and such in your hiking pack there are some new technologies we discussed with Dr. Meldrum on our February 2017 Podcast regarding 3D Scanners. The excellent feature of these new gadgets are there pack weight and the battery life. If used actively, scanners can last up to 4 hours, and if on standby, more than 1000 hours (a lot of time in the field without having to carry water which weighs down your pack). A good 3D Sensor’s frame is made of good-quality anodized aluminum, which provides an optimum temperature for the precision optics placed inside. iPads are not the only device compatible with this gadget, but also any other iOS device which has the possibility of using the Apple Lightning connector. 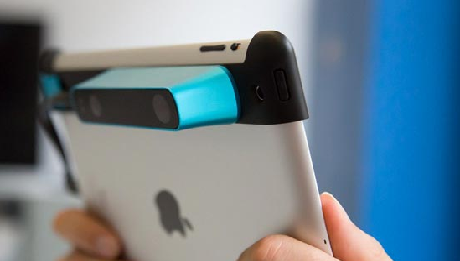 Occipital also stated that they will provide drivers for various platforms, such as Linux, Android, Windows and OS X.